Soak the chana overnight. 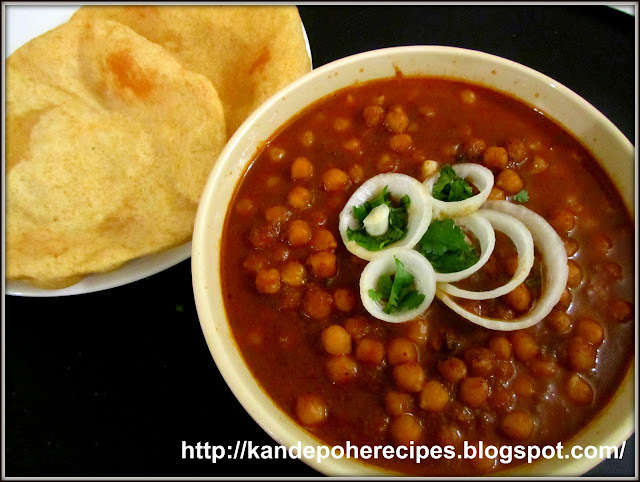 Cook the chana in a Pressure cooker till 2-3 whistles. Cook as per your own judgement. Dry roast the spices and coarsely grind them in a blender. Keep this aside. Heat up 2 tsp of oil in a pan. Add onion cubes to it and saute till onions becomes slight brown in color. Add ginger and garlic and saute for a minute. Switch off the heat and let the mixture cool down completely. Make a puree of onions and tomatoes in a blender. Add little water to make smooth puree. Heat up 3 tsp of oil in pan. Add tomato-onion puree and cook till all moisture goes away. It will take around 6-8 minutes. Add paprika, ground masala, dry mango powder, and salt to taste. Again saute this mixture till oil starts to loose from spices. Add cooked chana along with water in it and mix well. Let the chana cook in gravy for about 5-6 minutes. Add lime juice and adjust the consistency by adding little water. Let the gravy simmer on low heat for 3-4 minutes. Switch off the heat and garnish with cilantro. Serve hot with bhatura or roti. LOvely picture. Makes my mouth water. LOved your blog. am folowing you.